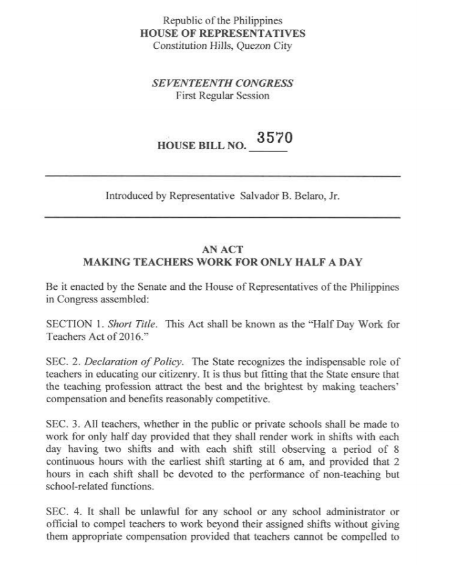 This Act seeks to implement a scheme whereby teachers nationwide will work for approximately only half a day so that they would have more time for their families, for self-improvement and to pursue other worthwhile purposes. Much has been said about the problem of low teachers' salaries in our country and the usual proposed solution to such problem, which has been to propose an increase in salaries. However, it's not all about money. The terms and conditions of employment also matter, and one way to incentivize our teachers is to give them more time to do worthwhile things. 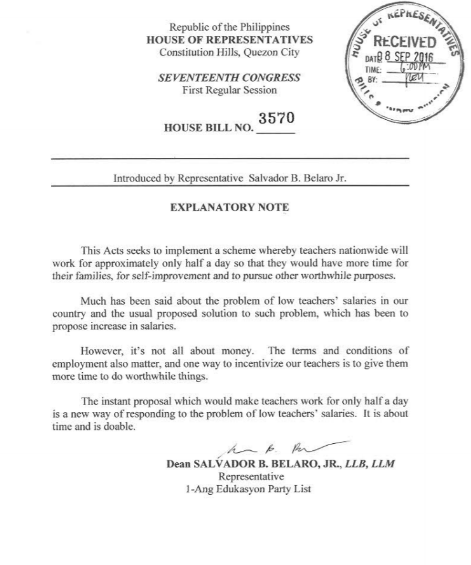 The instant proposal which would make teachers work for only half a day is a new way of responding to the problem of low teachers' salaries. It is about time and is doable.